Join me at the end of the month to make your own pressed flower art at the wonderful Green Rooms Botanical market! It has always been my dream to organise a mid summer eve celebration. And now my dream has come true, we will come together on 23rd June at the most wonderful of venues in the heart of historical Farnham. There will be creative workshops and yummy food, but most of all a gathering of like minded people all in search of a little escapism for a day. Join us! Have you ever fancied making your own wreaths? I'm holding a festive wreath making workshop at the beautiful Wattle and Daub shop and creative hub in Godalming. Join us this December for a cosy festive wreath making workshop. Held in the wonderful Clover Shed, you can expect a warm welcome, great company and a lot of Hygge. Join us for a winter wreath making workshop. Held in the atmospheric Wattle and Daube creative hub in Goldalming, I will guide you through how to make your own long lasting festive wreath. Have you ever fancied making your own wreaths? I'm holding an Autumn wreath making workshop at the beautiful Wattle and Daub shop in Godalming. 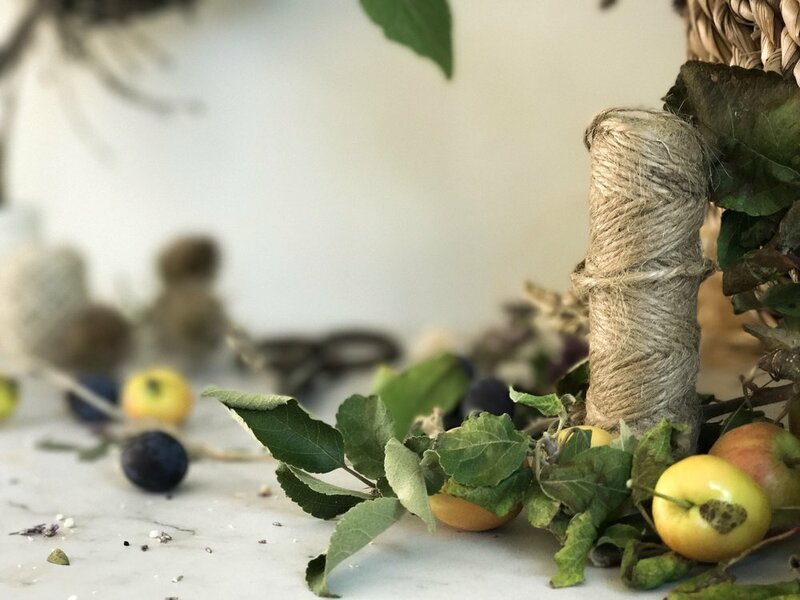 Using a mixture of dried and fresh flowers, seasonal foliage and seed heads with natural woven bases, you will learn how to craft your own wild, natural wreath to take home. Whilst some of the ingredients you use to make your wreath will be fresh, they will all dry out over time and look beautiful hung inside or on your front door. Small, intimate groups of no more than eight people, you can expect laughter, creativity and a little bit of gin thrown in for good measure! Visit Eventbrite here to secure your place!